Translation software makes things much easier when doing anything that involves a foreign language. From checking if you've written something correctly to identifying an unfamiliar term, these applications open up many possibilities. Google Translate is the go-to translator nowadays due to its simplicity and ease of access. 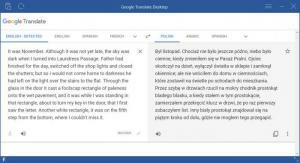 However, Google Translate Desktop makes it even more accessible. As the name suggests, it brings the advantages of this translation service to your desktop. It works just as fast, without altering anything to change your experience. Just type or paste what you need to translate and the application will take care of the rest. The application is absolutely free, and you can have it up and running on your computer in just a few seconds. It's compatible with all modern Windows platforms, and it doesn't ask for any special tools or services. Also, you won't notice any impact on your computer's performance when you run it. The compact user interface has the same layout you know from the Google Translate web page. All you have to do is type or paste text in the left box and its translation will appear in the right one. By default, the application detects the input language automatically, but you can also manually set the input language and, of course, the output one. The software comes with all the little options you are used to seeing on Google Translate. For example, you can instantly switch the input and output if you want to translate the other way around. If you have text copied to the clipboard, you can paste it at a moment's notice by simply clicking a button. What's more, the application provides you with other input methods, like speaking into a microphone or hand-writing the text. With Google Translate Desktop, you can enjoy all the conveniences of Google Translate directly from your desktop. You can use Google Translate on your desktop. It has the same layout and it provides you with the same options. You can have the application up and running in just a few seconds. There are no particular issues to address. You can download Google Translate Desktop free here.